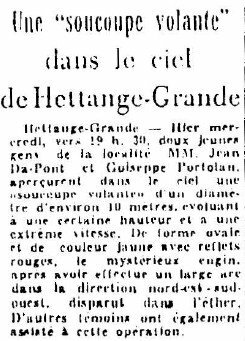 Reference number for this case: 5-Oct-54-Hettange-Grande. Thank you for including this reference number in any correspondence with me regarding this case. Hettange-Grande. -- Yesterday Wednesday, around 7:30 p.m., two young men of the locality, MM. Jean Da-Pont and Giuseppe Portolan, saw in the sky a "flying saucer" with a diameter of about 10 meters, moving at a certain height and at an extreme speed. Of oval shape and yellow color with red reflections, the mysterious machine, after making a large arc in the northeast-southwest direction, disappeared in the ether. Other witnesses also attended the operation. [---] Article in the newspaper , France. 1.0 Patrick Gross February 24, 2017 First published. This page was last updated on February 24, 2017.